Gunter Koschorrek wrote his illicit diary on any scraps of paper he could lay his hands on. As keeping a diary was strictly forbidden, he sewed the pages into the lining of his thick winter coat and deposited them with his mother on infrequent trips home on leave. The diary went missing and it was when he was reunited with his daughter in America some forty years later that it came to light and became Blood Red Snow. The author was a keen recruit at initial training and his excitement at the first encounter with the enemy in the Russian Steppe is obvious. The horror and confusion of fighting in the streets of Stalingrad are brought to life by his descriptions of the others in his unit; their differing manners and techniques for dealing with the squalor and death. He is also posted to Romania and Italy, assignments he remembers fondly compared to his time on the Eastern Front. This book stands as a memorial to the huge numbers on both sides who did not survive and is, over five decades later, the fulfillment of a responsibility he feels to honor the memory of those who perished. 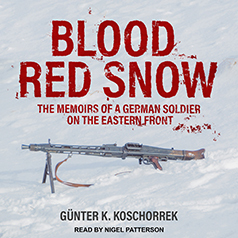 Gunter K. Koschorrek was a machine-gunner on the Russian front in WWII. He lives in Germany, having retired from his job as managing director of a sales company.